Brisbane schoolgirl, Nell McLennan, wants nothing more than to be noticed by her work-obsessed parents. When she is sent to the tiny township of Sippy Creek to spend two weeks of the Christmas holidays with her estranged grandfather, her goal seems even further out of reach. A catastrophic last day of school has only compounded her misery. As she wanders the basement of the local school, searching for the personality-improving Drama course that her mother has enrolled her in, she discovers a sign that perfectly summarises her state of mind. Desperate to escape the mess of her life, Nell follows a compulsion and opens the door at the bottom of the stairs. In that instant her wish is granted and she finds herself in Refuge, a world created from the fractured mind of eighteenth century psychiatrist Dr Nathaniel Fray - a man led to ruin by the desire to find a cure for his brain damaged son. 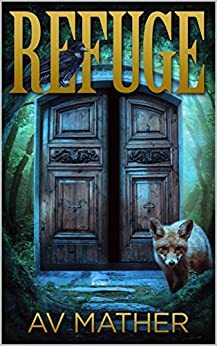 In Refuge she meets dysfunctional children not only from different parts of the world, but different eras, all lured to this seeming safe haven by the Doctor who provides care and shelter for those in need, but at a terrible price. Nell is lost in a world that is both a utopia and prison. Everyone is telling her a different story and she has never had to rely on her own instincts before. Truly alone and out of her depth, she must decide who to trust among a host of dubious characters. With only three days to choose her future before she is trapped in Refuge forever, Nell discovers her self-worth and learns that the easiest road is not always the best. 5.0 out of 5 starsAte it up! Wowsers, what a suspenseful, atmospheric read! I was sucked in right from the opening and sat up way too late reading, but I simply had to see whether Nell would escape Refuge. An amazing cast of characters, and a super-satisfying ending. I don't read a lot of Young Adult novels, but this one should be made into a movie, it's that good! 5.0 out of 5 starsDelightfully intriguing. This is a fabulous story and not just for young adults either. After deciding I should trial read it first before my daughter, I found myself enthralled and unable to put it down, needless to say we both loved it. AV Mather has done a brilliant job of captivating the imagination of the reader and I certainly look forward to reading more from this wonderful author. 5.0 out of 5 starsEngaging! I am almost 50 but loved this book. It was so easy to read but descriptive and surprising. It kept me interested from beginning to end. Nell is beginning to think that she doesn’t belong anywhere. Her parents have always been distant, but sending her away so that they can have a holiday without her is a new low. Her best friend, Josie, is fighting with her. And the place that she’s been exiled to is Townsville; a tiny town with nothing to do and only a crotchety old man for company. The old man in question – her grandfather – is as prepared as everyone else to let her know how unwelcome she is. Then, when everything becomes too much, Nell falls through a doorway and finds herself in another world. If Nell’s new friends, Janus and Fox are to be believed, Refuge is a terrifying fantasy world created from the mind of a madman. But the further Nell explores, the more Refuge looks like something else. A haven from the loneliness of her real life. I went into Refuge knowing nothing about it, but with a glowing recommendation from a friend. I read a bit of Middle Grade but only the novels that transcend their target audience. Refuge does. I love the lively imagination of Refuge. It’s a world that opens for any young person who feels vulnerable or superfluous. The history behind the world is unique and complex, which renders the characters living in the world unique and complex. Mather works shades of grey into her novel with exquisite skill. All of the children in her novel are lost, but Mather doesn’t mistake being vulnerable with being good. Characters are pretty amazing in this novel. They come from a wide range of backgrounds and eras. Playing guess-the-time-period based on their speech patterns is a lot of fun. Though time period isn’t the only thing to guess. Social standing and nationality come out in the speech patterns too. All of them are pretty much exactly what I’d expect for the characters’ time periods and birth places. Speech doesn’t exactly a character make, so as to the substance behind the words, that’s pretty impressive too. Janus is immediately likable. Her character – confident, decisive and abrupt – comes alive from the first page. The villains however, are in a class of their own. There are three major antagonists and they all have their own quirks, goals and motivations. There is so much room for another novel in this world and I really hope that it eventuates. This novel was an amazing adventure, but it’s only whet my appetite for a more definite conclusion. Loved this book! Fantastic and relatable characters and a fast paced and thrilling story. The main character is a 12 year old trying to find her way but I thoroughly enjoyed the book and I'm in my thirties. It's great to read a new Australian author and hear about Australian places and people in a fantasy setting. I'd fully recommend and this Author is definitely one to watch!! Absolutely loved this book - great Australian setting and characters with a good dose of fun and fantasy thrown in and add some life affirming lessons for good measure. The characters were all great, well developed and so visual. Cause the plot kept humming along, I found I couldn’t put it down. All round, a cracker of a Read!!! I couldn't put this down. Loved the characters. Loved the story. Loved the style. Can't wait for the next instalment.